Wrath of the Eternal Warrior #11 by Valiant Entertainment will be unveiling a new story arc, written by Robert Venditti and illustrated by Robert Gill and Kano. Gilad Anni-Padda, the Eternal Warrior, has existed since time immemorial to protect civilization from heinous and darkened forces. Blessed or cursed with the powers of physical regeneration he cannot die. But, in the new storyline Gilad Anni-Padda will be granted the ability to return the beloved family he has outlived during his timeless and ancient lifetime. The dilemma is will he make a covenant with the devil in exchange. The Eternal Warrior is confronted with a malevolent evil who bargains the chance for this resurrection against a terrible price. 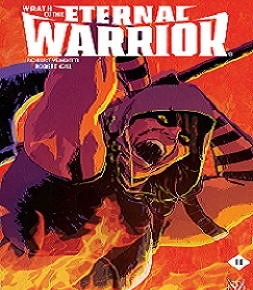 The Wrath of the Eternal Warrior “A Deal With A Devil!” sets Gilad on a new journey. Robert Venditti (X-O Manowar, Green Lantern) has created some mesmerizing and engrossing storylines on many past occasions this season. The Eternal Warrior concept was originally created by Jim Shooter and first appeared in 1992’s Solar: Man of the Atom #10. Valiant re-introduced the character in 2012, who is now integrated into the universe of other Valiant personalities (Archer & Armstrong and X-O Manowar). Our opinion is that this would make an excellent movie adaptation, but who should portray the Eternal Warrior. Wrath of the Eternal Warrior #11 will be available from September 14, 2016.